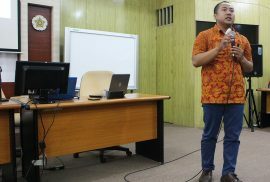 (Yogyakarta, 28/2) SV UGM, Research and Community Service Unit (PPM) held a seminar of Intellectual Property Rights (IPR) on Wednesday, February 27, 2019 at SV 225. 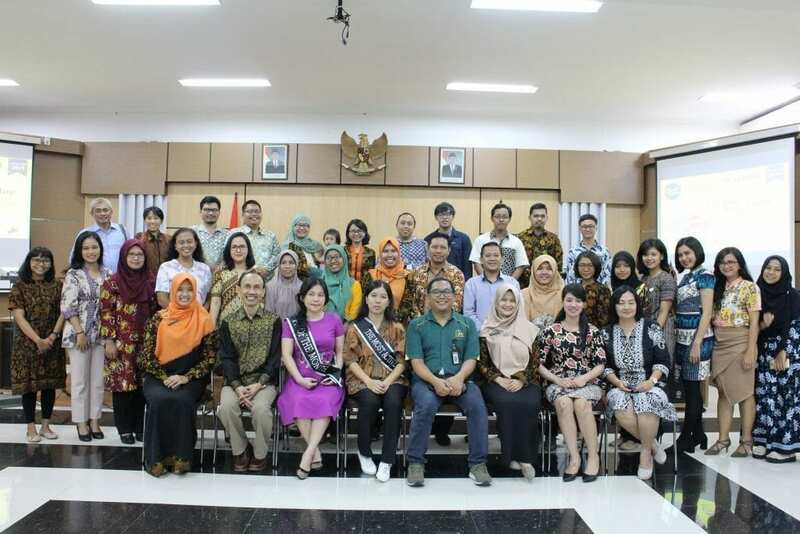 The participants are approximately 40 people consist of SV UGM lecturers, UGM Research Directorate, Dean of SV UGM Mr. Wikan Sakarinto, ST, M.Sc., Ph.D., Vice Dean SV UGM Dr. Silvi Nur Oktalina, S.Hut., M.Sc., and several students. The seminar aims to provide an explanation to the lecturer about IPR, Patent Rights, and Final Assignment Recognition (RTA). It was delivered by three speakers, they are, Prof. M. Hawin, S.H., LL.M., Ph.D. (Professor at the Faculty of Law) about IPR, then Patent Rights by Ferianto, S.Si, (Center for Utilization and Innovation in Science and Technology Worker at the Lembaga Ilmu Pengetahuan Indonesia(LIPI)), and RTA material by Dr.biol.hom. Nastiti Wijayanti, S.Si., M.Sc. (Head of the Research Program Subdirectorate UGM). “Later there will be a socialization of RTA so that Sekolah Vokasi will be able to include at least 20 RTA proposals, 20 final assignments for students” said the Dean of SV UGM in his speech. By understanding IPR, Patent Rights, and RTA, SV UGM lecturers are expected to be able to increase the amount of their researches. 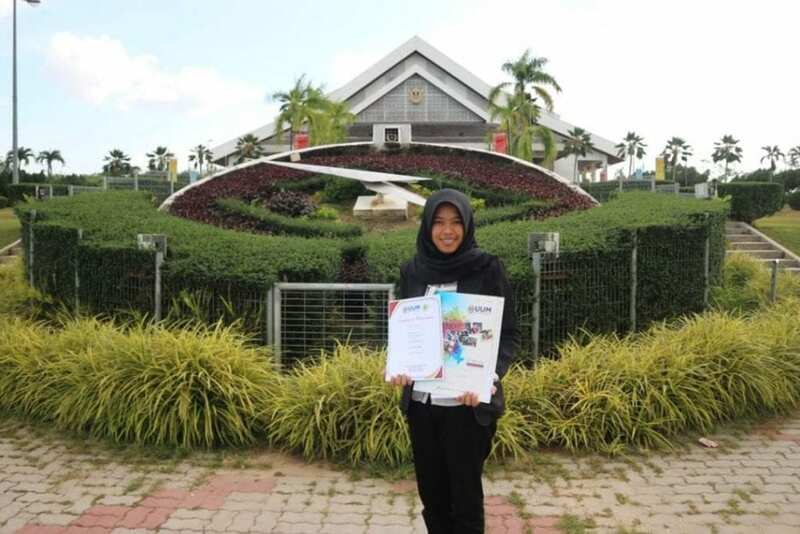 (Yogyakarta, 10/2) Lutfiana, student PJSIG study program 16 won the gold medal in a Thailand Inventor’s Day Competition (IPITEX) 2019 that held at the Bangkok International Trade and Exhibition Center (BITEC). The event lasts for five days from the 2 until 6 February, 2019. IPITEX is an international event held in Bangkok, Thailand, lasting five days and attended by more than 425 participants from 25 countries. Each participant presented their ideas and innovations. The participants also varied from Canada, China, Croatia, Czech Republic, Egypt, Hong Kong, India, Iran, Japan, Macao, Malaysia, Morocco, Philippines, Poland, Romania, Russia, Singapore, South Korea, Sri Lanka, Sudan, Taiwan , UAE, Vietnam, even Indonesia. She was motivated to take part in this competition because she wanted to publish and present the work of innovation and technology in the international. In addition, she also wants to increase relations from other countries. In there, she did many activities such as exhibition or exhibition of works, presentations, judging, and awarding ceremony. “So amazing and enthusiastic in this event because I was not expecting the preparation to short just 3-4 months and finally won the gold medal”.”dare to try new things, start, and try to give the best in accordance with the ability and believe that God will always hear the prayers and the efforts,” she added. 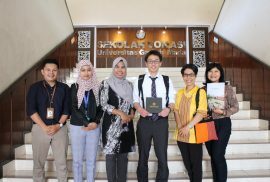 Yogyakarta (6/2) – Ibaraki University visited SV UGM on Wednesday, February 6, 2019 at SV 233. 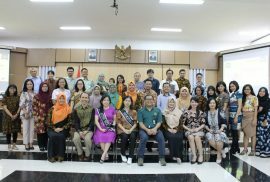 The guests were Mr. Keito Motegi, representative of Ibaraki University KUI staff who was accompanied by Ni Nyoman Indriyani from the UGM Faculty of Agriculture UGM, Listya Puspita Pandanwangi from ASMI Santa Maria, and the staffs of KUI SV UGM. The visit was part of the agenda of Staff Exchange program from Ibaraki University Office of International Affairs (OIA). One of the activities was visiting OIA exchange information at faculties in UGM. During the event, SV UGM representative shared about Sekolah Vokasi UGM, then shared about the possibility of collaborating with Ibaraki University such as Student Exchange, Internship or Community Service, which had previously been carried out by the Faculty of Agriculture UGM, especially in the field of Agriculture and Agroindustry. The program then continued with question and answer session and ended by giving a token. Mr. Keito Motegi expressed his delight at his visit to SV UGM. Ibaraki University is a university that was founded in 1949 in Bunkyo, Japan. The university has five faculties, they are College of Humanities, College of Education, College of Science, College of Engineering, and College of Agriculture. 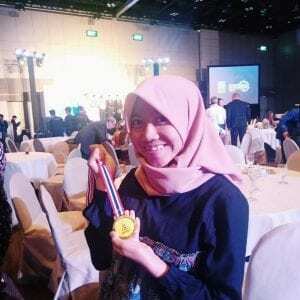 Yogyakarta (1/2) – Nadya Anggraini, Student of D3 Medical Record and Health Information SV UGM 2017, won the 3rd Winner on the Global Entrepreneurship Youth Summit 2019 with the title “Life Lighter: Application for Connecting Smoker (want to Quit from Their Bad Habit) with Professional Health Worker at Smoking Cessation Therapy “. The event was held at the Malaysian Global Innovation and Creativity Center (MaGIC) 3730, APEC Broadcasting, Cyberjaya, Selangor, Malaysia on the 26th until 29th January, 2019. The Global Entrepreneurship Youth Summit is a program to accommodate influencers, the Start-Up community, and industrial owners from various Asia-Pacific region countries who collaborate to solve problems in the field of entrepreneurship and develop innovate ideas and evolutionary. The program is themed “Shaping the Future of Entrepreneur” which consists of several series of events, namely Inoperative Conference, Innovation Lab., Business Innovation Clinics, Gala-Networking and Competition, and Business Plan Competition. The participants also varies from several countries in the Asia-Pacific region such as Cambodia, Vietnam, Malaysia, India, Bangladesh and Indonesia. Nadya admitted to be very happy and grateful, able to learn from business people and young entrepreneurs in running their business. During the activity, she could get tips on success in the field of entrepreneurship. Not only that, she also got relations and advice for the start-up sector, so that it could be used as an encouragement to realize this idea. 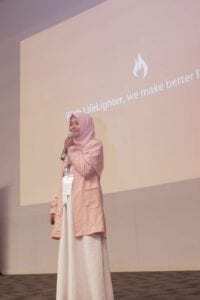 She was motivated to follow this field because she wanted to take part in solving the problem of smoking in Indonesia, which has become the top three causes of deadly diseases. 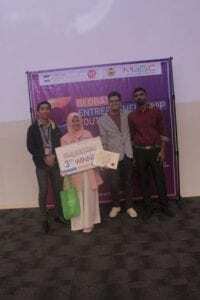 Then she got an idea to create an application that connects smokers who want to quit their cigarette habits, with health workers who have the certification of “Smoking Cessation Therapy”, because the idea is not specific, finally she tries to introduce her idea to entrepreneurs through the program GEYS 2019, with the hope of getting very good advice and criticism. She also said “Don’t be afraid to dream, when there is one of dream, make it happen, and realize it, many obstacles are okay, but give up is wrong,” she said. Yogyakarta (31/1) Student of D3 Civil Engineering Study Program, Divvia Nurray, Receive the Best Award in the Student Conference on Optimizing K3 (Occupational Safety and Health) with his work “Realizing ZERO ACCIDENT Construction Development with the Kind of HR Quality?”. 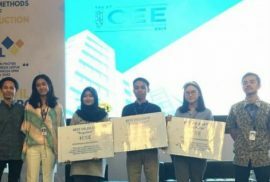 This activity was held in order to welcome the Modern Methods of Construction ITB Civil Engineering Expo (ICEE) 2019 and was held from 24th until 27th January 2019 at the Institut Teknologi Bandung, and there were three events at once, namely conferences, competitions and national seminars. Divvia was motivated to take part in this event because she felt that the issues were contested is accordance with her fields, and there are many large-scale developments in Indonesia where infrastructure development still continues. On the other hand, there was also a lot of news about construction accidents to workers who were victims so she was interested in reviewing how construction workers, HR management systems related to the construction of occupational safety and health projects. In addition, the purpose of this conference was to provide insight the background system of implementation and supervision of K3 in Indonesian construction, knowing the challenges faced in managing HR in the field of K3. On there,she did many things such as the first day of the student conference, which was divided into three stages, namely the presentation of K3 material, then focus group discussion (fgd) with a focus on the topics chosen by each delegation, and the large fgd where each representative presented their topic. The conference was closed with a conference delegation signature session above the conference results document. The second day each delegation got a free ticket to the engineering expo, which was included in the ICEE program in the West Hall of ITB, followed by the third day, City Tour and the fourth day each delegation got a free ticket to attend the ICEE seminar at West Hall of ITB. The delegation participants also varied from UI, UGM, UNAIR, UB, UNS, UNUD, etc. Divvia admitted that she had a very valuable experience, from a topic that she adopted. She advised that to get an achievement, stay focused on writing/expressing what will be discussed according to the theme, “Direct to the main problem, not describing the problem or issue in general,” she said. 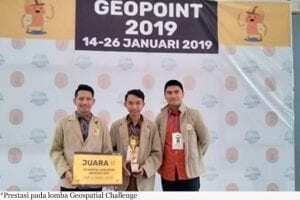 Bandung — SV UGM students, Iqbal Hanun Azizi (2016), Adji Dwi Nugroho (2016), and Dhani Yudi Prasetyo (2018), from D-III Geomatics Engineering Study Program won the ‘Geospatial Challenge’ competition in Geopoint 2019. This competition aims to measure the ability between Geodesy and Geomatics students throughout Indonesia in understanding the field of geology and to establish friendship and improve knowledge of geodesy and geomatics. This activity was held on January 18-20 2019 at the Institut Teknologi Bandung. 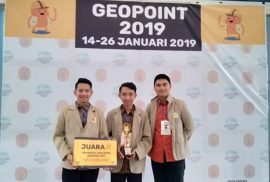 According to Adji, the motivation to take part in this competition is to find out how far they understand in the field of Geodesy and Geography both theoretically and practically. 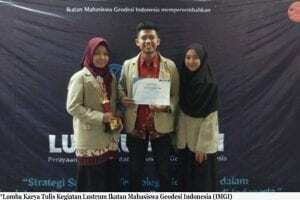 In addition, he wants to prove that the D-III Geomatics Engineering Study Program SV UGM is also able to compete nationally. The stages of the competition were divided into several stages: the registration file selection, theoretical allowance, preliminary of practitioners, and the final round with the Quiz Competition. Adji said that “This team was formed independently and continued to coordinate with each other regarding learning material that had not been learned to establish chemistry”. 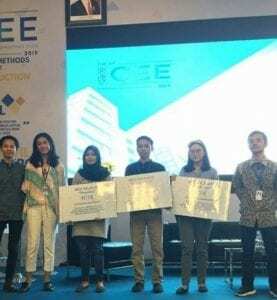 In other activities, Students of D-III Geomatics Engineering Study Program SV UGM, represented by Ary Pratama, Dhita Safira, and Berlian Puji also won achievements by becoming the Champion III of the Writing Competition by Indonesian Geodesy Student Association (IMGI). Lustrum IMGI V is an activity of the Indonesian Geodesy Students Association held every 5 years, which aims to unite and bring together between geodesy and geomatics students throughout Indonesia with a series of activities such as competitions and so on. This activity was held in Institut Teknologi Bandung (ITB) on January 18-20 2019. The title of their work in this competition is “SMARTOLL (Solution for Toll Network Analysis) as A Renewable Innovation to Analyze the Effectiveness of Travel Accommodation”. The team of D-III Geomatics Engineering Study Program won the 3rd place by defeating other teams, most of whom are undergraduate students. Sekolah Vokasi (25/1) – English Study Program Sekolah Vokasi (SV) UGM hosted the Public Relations Family (Kapurel) Meeting Goes to Campus. Kapurel always holds regular meetings every month and presents different speakers. The event was attended by inviting guests from lecturers of the English Language Study Program and PR from various business organizations or institutions in Yogyakarta. As the Head of Kapurel Yogyakarta, Mr. Hairullah Gazali in his remarks said that “This meeting is different because it is our first time to conduct it in campus. Usually, the meeting is held in the hotels. This time we bring the theme ‘Creating Brand Value’, about how Public Relations can work together with marketing in building a brand,” he said. Then, Ms. Erlin Estiana Yuanti, S.S., M.A., as Head of English Study Program, welcomed and thanked the guests for coming. “We aim that in the future the curriculum will focus on the application of English in the Business Communication specifically for Public Relations. Hopefully, we can all work together,” she said. 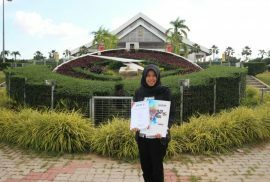 (23/1) Eka Hafsari, Student of D3 Management Study Program SV UGM 2017, won the Best Paper Award ASEAN Student Conference 2019. The title of her paper is Forest Protection Group and Springs Preserves as Life Supporters of Mendiro Village. 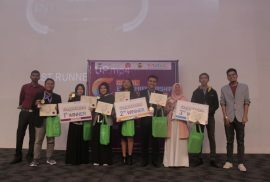 The ASEAN Student Conference (ASC) was held at Universiti Utara Malaysia, 20-26 January 2019. ASC has been held for two years; ASEAN students can send their papers related to the environment and those who are qualified will be invited to attend the conference. The conference aims to understand the background of environmental problems and find solutions in regional, national, and international level. Eka was motivated to take part in this activity because she felt she had anxiety in the field of environment, especially deforestation of forest. Despite her concern that not many teenagers didn’t care about the forest, many adults still care about their environment. During the conference, Eka participated in several events including phonferences, forum and discussion, bonding, games, and field trips. 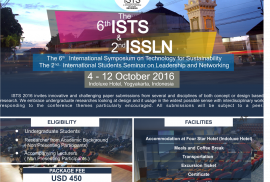 The participants are varied from Indonesia, Malaysia, Vietnam, even Brunei Darussalam. “I’m happy that when I bring the issue here, it seems like we face the same problem. I can offer different innovations that can be easily applied throughout the country,” she said. 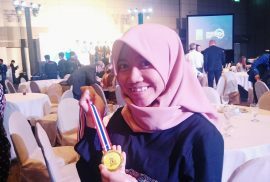 She hopes that the teenagers would love to understand more about the background of environmental problem in Indonesia and could find solutions to solve these problems. Yogyakarta (21/1) Dean of Sekolah Vokasi (SV) UGM, Mr. Wikan Sakarinto, S.T., M.Sc., Ph.D. and President of Cyber Hankuk University of Foreign Studies (CUFS), Korea, Joong Ryul Kim, Ph.D. officially sign the Memorandum of Understanding (MoU) and Memorandum of Agreement (MoA) between the two parties in SV 138. This event aims to establish cooperation in academic, service, and research sector. On this occasion, the Dean of SV UGM is accompanied by Vice Dean of Academic and Student Affairs, Vice Dean of Research and Community Service, International Affairs Office and Public Relation & TIK team, Head of DBSMB, and Head of Korean Language Study Program. Before the signing of the MoU and MoA, they discussed the cooperation program in detail. The MoA contains the program of extension study for students Korean Language Study Program in CUFS; at least for three semester. For MoA itself, it contains an exchange program for staffs and lecturers for teaching, research, and service activities. CUFS is a university with specifically focused on mastering native language, and the special thing is the learning system in CUFS is online. It can be accessed anytime and anywhere. The Dean of SV UGM welcome the guests from CUFS and hopes this cooperation between SV UGM and CUFS would give the benefit especially for graduates from Korean Language Study Programs. In his speech, the president of CUFS expresses his excitement at being able to work with SV UGM. “I hope this MoU and MoA would not stop in here, I hope it can bring the positive impact for us” as he said on his speech. CUFS then continues their agenda to give the socialization to student SV UGM Korean Language Program Study related to this programs. They hope the students can join and experience international exposure in CUFS.